Whether you’re out for a walk, out in the garden or just around the house, it can sometimes feel like you can’t turn your back for a minute without your dog eating something they shouldn’t. Plants can be an easy target, but many garden and houseplants can be harmful to dogs when eaten. While most harmful plants have an off-putting taste, some dogs just can’t help biting off more than they should chew – especially puppies, who love to explore the world with their mouths. So we’ve rounded up a handy list of plants that are dangerous, poisonous or toxic to dogs, and advice on what to do if your dog eats one. Which common houseplants are poisonous to dogs? Some house plants that are great choices for your home can be mildly irritant or toxic to dogs if eaten in quantity. Others can be of lower risk if put out of harm’s way. We’ve broken them down into groups, ranging from zero to high risk for your dog. 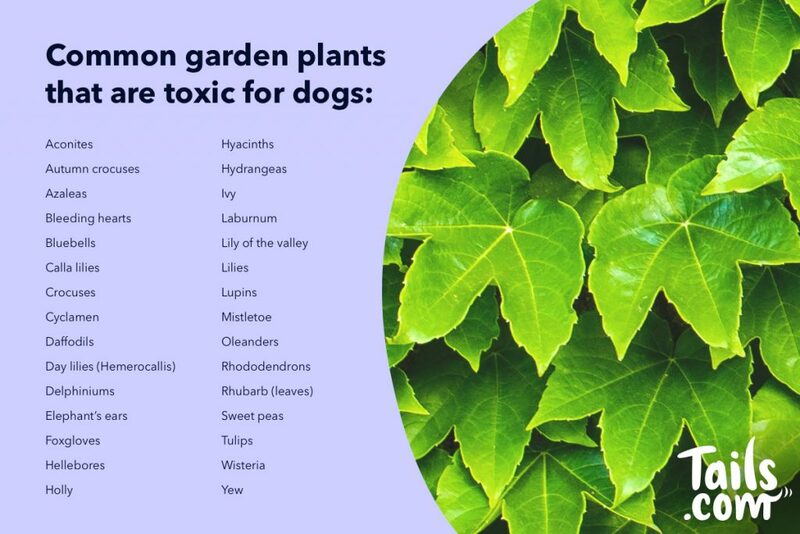 Which common garden plants are poisonous to dogs? What can happen if my dog eats a plant that’s harmful to them? Symptoms can vary depending on the plant, and what part of the plant your dog has eaten. In some cases, if your dog eats part of a dangerous or poisonous plant, they’ll experience an upset stomach with sickness or diarrhoea, or perhaps irritated skin. If the plant is toxic to dogs (such as the foxglove) the impact can be much more dangerous and will require emergency veterinary care. It’s also important to note that some plants can be more poisonous for dogs than others – for example, daffodil and crocus flowers can be harmful, but their bulbs are more dangerous to your dog – bulbs are more concentrated than leaves or flowers so can be more harmful, and can be more tempting to eat if left lying around. Other bulbs, like onions and garlic, can also be toxic. You should take your dog straight to the vet if you think they’ve eaten any of these bulbs. What symptoms might indicate my dog has eaten a poisonous plant? What should I do if my dog eats a poisonous plant? It depends what your dog has eaten. If they’ve simply munched on a few leaves that will make them sick, a little TLC is probably all that’s needed. But we don’t expect you to be a horticultural expert and identify every plant or how much of one has been eaten by your dog. So if you’re in any doubt about whether they’ve ingested part of a dangerous plant, you should visit your vet as soon as possible. .
It’s useful to take the plant with you to help your vet identify what your dog’s eaten. Common names for plants can vary (for example, there are three different plants commonly known as bleeding hearts), so having the plant to hand will help your vet correctly diagnose your dog. Treatments can range from simply making your dog sick to treating them for toxicity or even surgery if necessary. How can I stop my dog eating dangerous plants? Fortunately, many harmful plants have a horrid taste which puts most dogs off trying to eat them. At home, prevention is the best course of action:it’s better to not have any houseplants that are harmful to dogs. If you do, make sure they’re only in places where your dog won’t come into contact with them, and that they’re never at dog-level. Outside, the trick is to be observant and ready to intervene if your dog looks like they’re about to eat something they shouldn’t. Whether in the garden or out for a walk, if your dog starts sniffing a harmful plant, a quick, sharp ‘no’ should do the job. But don’t count out having to physically remove your dog from the plant – or indeed a part of the plant from your dog’s mouth.